Senior forward Frank Bak leads the Braves’ attack at Shea Stadium on Sunday against Wisconsin. Photo by Justin Limoges. The Bradley soccer team extended its undefeated streak to six games this season (4-0-2) after last weekend’s Bradley Invitational at Shea Stadium. The Braves came out with a 1-0 victory against Eastern Illinois on a rainy Friday night and a scoreless draw against last year’s Big Ten Conference champion Wisconsin on Sunday. The Bradley-EIU game kicked off with a different tempo as slippery conditions required both teams to play more cautious in hopes of not giving up a potential goal-scoring opportunity. The first half ended 0-0 with only eight shots between the Braves (5) and Panthers (3). The second half picked up to a quicker pace, however, as senior forward Frank Bak dribbled by multiple Panthers down the left wing. Bak laid off a ball for sophomore forward Gerit Wintermeyer to tap in and score his third goal of the season, to go up 1-0 in the 48th minute. Bradley head coach Jim DeRose praised the team’s efforts through the poor conditions and commended Bak for the hard work that resulted in Wintermeyer’s goal. 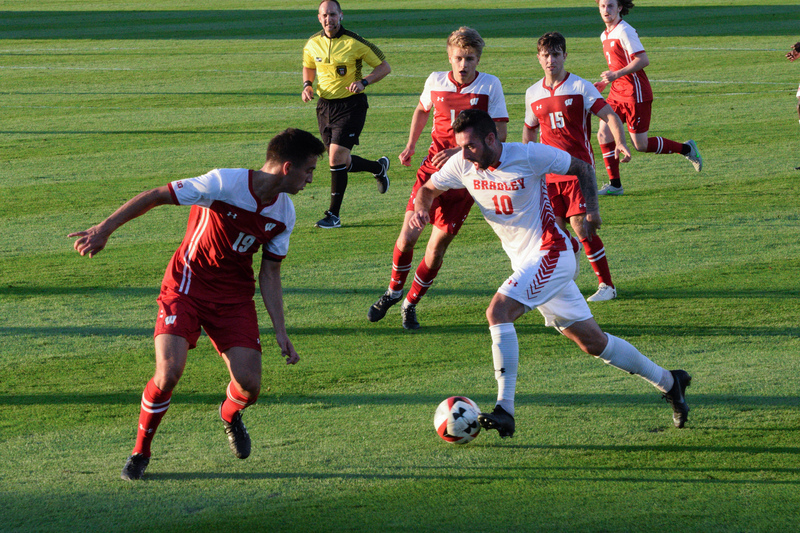 Bradley needed just one goal to hold its ground in the match as they won 1-0 at the end of regulation against Eastern Illinois. Redshirt junior Albert Reinwart stopped all four shots on goal from the Panthers to earn his first career shutout. 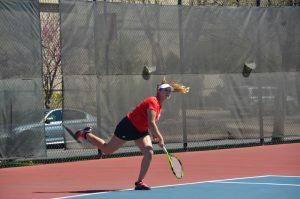 Sunday’s draw against Wisconsin was a tougher match for Bradley. 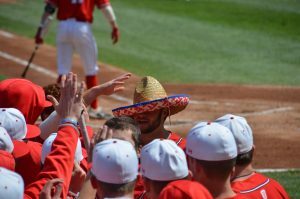 The defending Big Ten champions, while having lost many vital starters from last season, were looking to make an impact at the Bradley Invitational, according to DeRose. Both teams had their opportunities to score in the first half, with Wisconsin getting a shot on net, which forced Reinwart to come out and challenge. Bak also made a huge run on the left flank and sent a deep cross into the Badgers’ box, which missed a sliding Wintermeyer by inches. Wintermeyer believed the team needed more great plays from the outside like Bak’s to continue playing successfully throughout the season. Nevertheless, the first half ended scoreless. The second half was highlighted by Wintermeyer yet again, as he saw his volley deflect off the crossbar following a corner kick in the 54th minute. Both teams continued to pepper in shots from multiple chances but to no result. The game ended 0-0 at regulation and proceeded into “golden goal” (sudden death) extra time. Extra time ended scoreless, ending the game at 0-0. Both teams combined for three total shots in the 20-minute golden goal period, with the Badgers edging the Braves 13-12 in overall shots throughout the entire game. On Tuesday, Reinwart was named Missouri Valley Conference Defensive Player of the Week for the second time in three weeks, thanks to his first two career shutouts. Bradley has had players featured in the last three consecutive weeks, with redshirt-junior defender Walid Kherat having won last week’s Defensive Player of the Week award. DeRose was very impressed with Bradley’s results that have led to the 11-game streak, which started back in October 2017 and is the second-longest streak in program history (four behind the 15-game streak from 2002). However, he noted how they needed to improve on the offensive side. 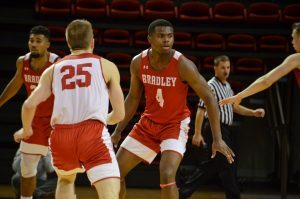 Bradley will travel to play Purdue University Fort Wayne today at 6 p.m. The team was supposed to travel to Appalachian State on Sunday. However the match was cancelled due to Hurricane Florence. At the time of our press deadline the team was actively looking to schedule a replacement match for Sunday.